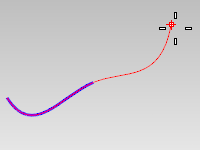 The Extend command lengthens or shortens a curve. Select a boundary object, type a length, or press Enter to extend without boundary edges. Select a curve or an surface edge near the end. The extension will be automatically joined with the original curve. To extend to multiple objects, pick the end of the curve again to extend the curve beyond the first boundary to the next. Pick the end of the extension or type a length. You can use any combination of curves, surfaces, and solids as boundary edges. If you want to extend two curves to meet each other simultaneously, use the Connect command. Lines, polylines, and polycurves with a line at the end to extend are extended by line. Arcs and polycurves with arc at the end to extend are extended by same radius arc. Other curves are extended smooth. Makes an arc extension tangent to the original curve. 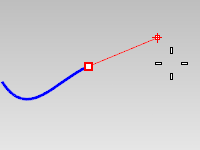 Extends a curve with an arc by picking the arc's center and endpoint. Pick the arc's center point. Pick the arc's end point. 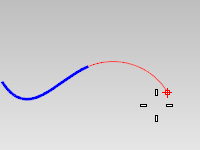 Extends a curve with an arc by picking the arc's endpoint. Makes a line extension tangent to the original curve. Makes a smooth curve extension curvature continuous with the original curve. Extends a curve smoothly by picking the curve's endpoint. Pick the curve's end point.